Get more out of Basecamp, save time with visual bug tracking! Basecamp keeps all your projects, data, and people in one place. No matter how many projects you have, or how many people are on the team. Everyone involved in a project can work together on Basecamp and you have full control over who sees which project, and who sees each other. It’s no longer a pain to coordinate everyone’s schedules. Ever got caught in an endless discussion in your Basecamp comments just to end up with requesting a screenshot for clarification? Usersnap lets you create useful bug reports for your web project directly in the browser. Screenshots in your todos reduce bug resolving time significantly. 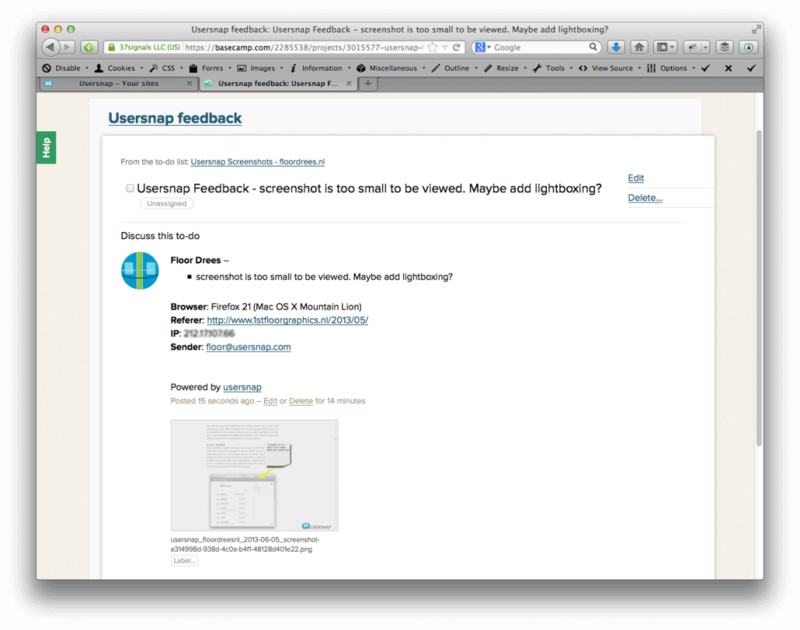 Usersnap integrates seamlessly with Basecamp to track bugs and receive visual feedback for your web project! 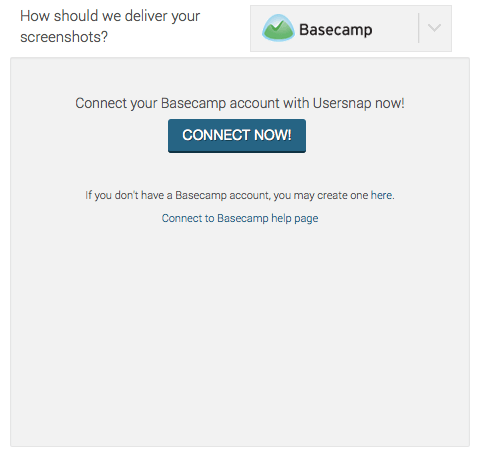 No additional Basecamp user is required to receive Usersnap screenshots in your Basecamp projects. To get started with Usersnap and Basecamp, you need to have both a Basecamp account and a Usersnap account. If you don’t have a Usersnap account, simply sign up for a free 42-days test ride (you don’t need a credit card for this). Add the code snippet you’ll find in your Usersnap dashboard to your website and edit the settings for your website. Next, select Basecamp as the service you want to use to collect feedback. 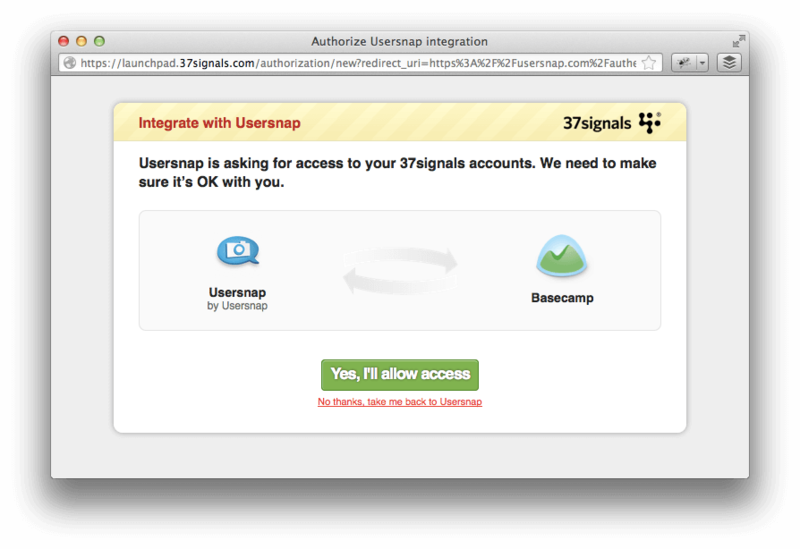 You’ll want to authorize the Usersnap-Basecamp integration in the pop-up window where we ask for access to your 37signals accounts. Point-and-click issue-reporting on web projects is always more effective than describing feedback textually. It is also an easy way to collect feedback from people outside of your project team as it’s easy to use. Feel free to try out Usersnap in combination with Basecamp – a 15-day free trial is available! * Shoot us an email if you could not successfully connect your Usersnap account to Basecamp. We’re happy to help!